Love all the different smiles on your candy corn they are wonderful Debbie. Your Jack is too cute, from what you described I wasn't expecting such a fun piece. I'm sure the receipant will enjoy him if you give him away. How big is he? Smiles4miles - love it, Debbie! I've asked to join. 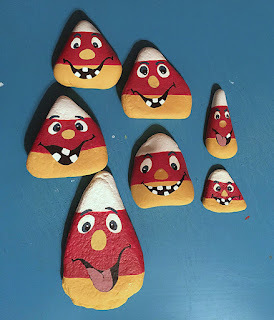 Your candy corn painted rocks are delightful and should bring smiles to many. I love the rocks and the idea that goes with them. Can't pass around too many smiles. I doubt though that leaving rocks around in Japan would work ... even if you left them in a restaurant or on a train, not many pick up things they think might belong to someone else. those candy corn rocks sure are going to get some smiles Debbie! Your candy corn rocks are cute as can be! 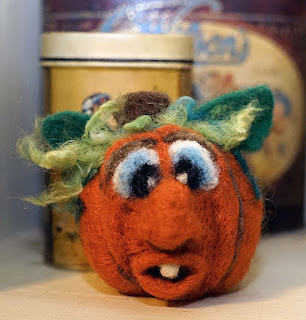 The candy corn painted rocks are great and the felted pumpkin is a HOOT. OMG look ve the rocks...and your Jack is a hoot!! Candy corn rocks are just too cute!